There’s been something on my mind for a few days now, and I need to pass the burden on. It isn’t fair for me to shoulder this alone. 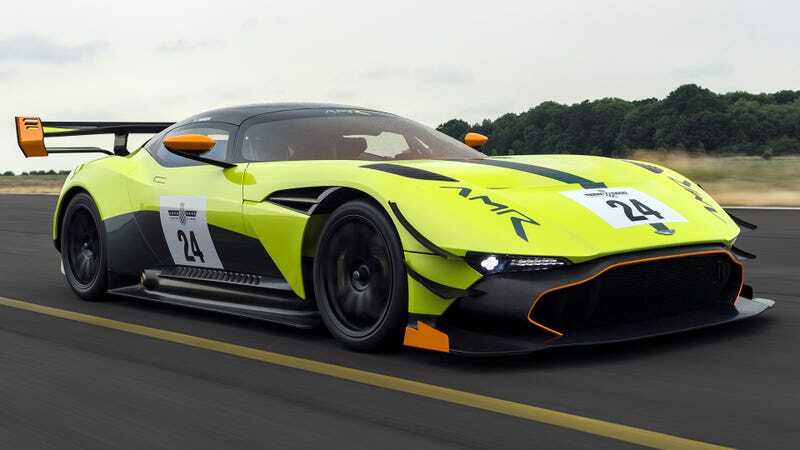 The Aston Martin Vulcan, the 800-horsepower, V12 track-only monster, has a new performance package to add even more track fury. It makes the car look like it has winged eyeliner. The package, if you care to know, includes changes to the six-speed sequential transmission for “intensified” acceleration and a few downforce- and steering-oriented add-ons. It also drops some weight from the engine cover. One such add-on is the series of dive planes that line the Vulcan’s nose, which you can see sticking out from and below the headlights. But who cares about what the dive planes do for the on-track grip when they just look so perfectly applied? Winged eyeliner is a fad and totally not my style, Aston, but these dive planes look better than any liquid makeup I’ve ever seen stem from somebody’s eyeballs. Brava. And even though I’m not a fan, those wings are, like, totally perf. Do you see how they curve so elegantly up from the outer edge of the headlights? This car must have studied a lot of tutorials to become such a makeup pro, and surely it’ll start its own YouTube channel to teach us. We should all be totes jealous. We need your tips on how to perfect our winged eyeliner, Aston. Don’t just bat your eyelashes at us when you destroy everyone at the track. You’re better than that. Surely you didn’t use tape or a stamp, and these wings look like they’d last way longer than any makeup primer could achieve. We just want have all-day wear like you. Now, of course, this Aston’s dive planes near the nose aren’t some kind of weird, new invention for track-oriented cars. It’s just that most others aren’t positioned quite like they are on the Vulcan: stemming right off of the edge of a thin headlight, curved upward almost artistically. It’s sort of like the Chevrolet Corvette, which has a back end that kind of looks like a drunk person sobbing through heavy makeup in the bathroom. But I’d rather perfect a makeup fad than get caught crying in a restroom, so, yeah. The Vulcan wins, on track and in makeup skills.